Day 2 features Debby of Debby Kratovil Quilts with the Wings collection for Contempo. 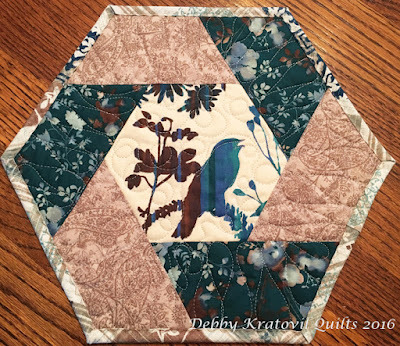 Debby works with one of her favorite shapes, the hexagon, to make a sweet mug rug with a fussy-cut bird silhouette. The colors in this Wings Collection by Jennifer Young really captured my attention. 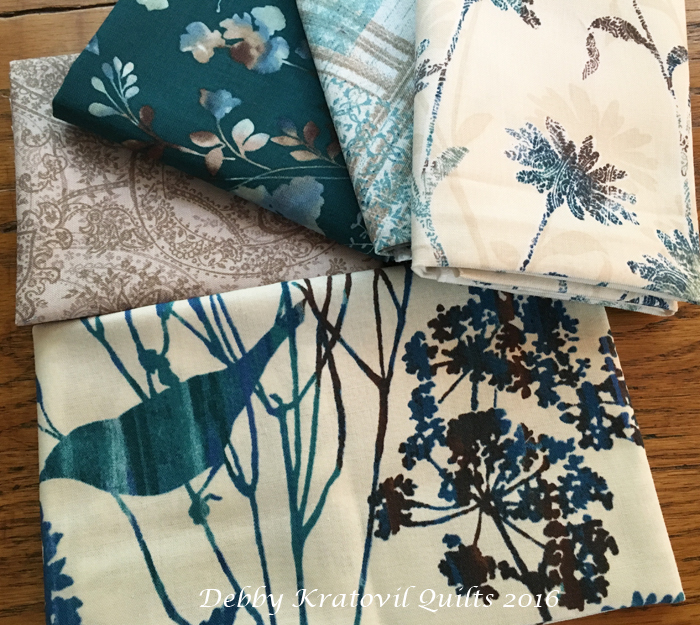 The deep aqua with the browns and taupes are a perfect complement to the sweet birds in the main print. What do you think? 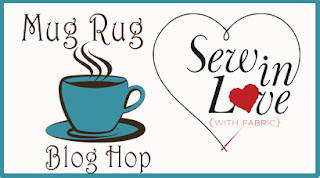 I was given 5 fat quarters and then it was up to me to create a mug rug for this blog hop. 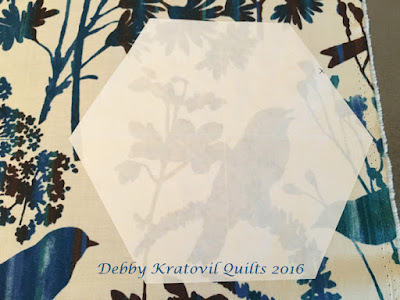 I was reminded of a free pattern by Pam Rocco at the Quilter's Newsletter web site for a coffee mug quilt. But, it seemed quite GIANT at a staggering 16". Way too much fabric for a mug rug. I scratched that idea (for these fabrics) and put my thinking cap on. I was now nervous because I had used a good bit of that gorgeous aqua print. Did I have enough to carry on? Of course! 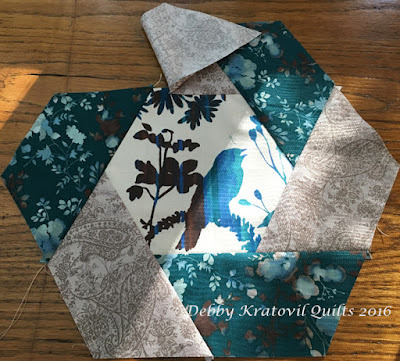 I turned to my trusty pattern, the Twisted Hexagon. 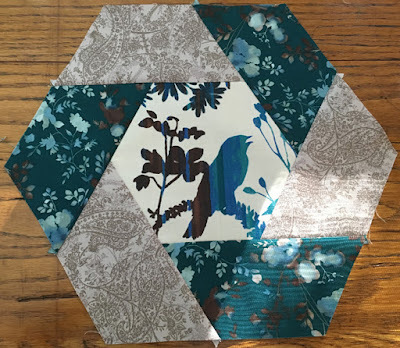 I would fussy cut the bird print for the center. That meant I had to make a freezer paper template so I could center the motif before cutting. I did just that. You can see my technique for cutting a whole hexagon with a standard 60 degree triangle HERE, which was a Technique Tuesday blog post on Sew in Love with Fabric. I was cutting 6-1/2" hexagons using the Head of the Class Collection. Then I selected two fabrics for the half-hexagons (cut from 3-1/2" strips). I cut 3 of each fabric. Then it was time to DO THE TWIST! You may think that there will be a y-seam in there somewhere. Don't worry - everything is straight-seam sewing. Do you remember how to make a "partial seam" from your garment sewing days? Well, I did and that's exactly how I constructed the first seam. This way I leave room for adding the last patch. Stay with me now. We are sewing the six half-hexagon patches around the center in a log cabin technique. Last half-hexagon joined. Now to finish the first seam! We twisted our way all around that little birdie! And how does this look finished? 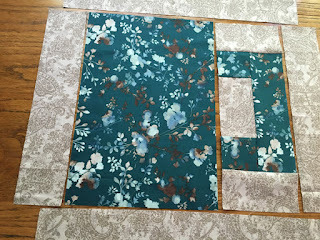 I machine quilted it on my HandiQuilter Sweet 16 and it was done in a flash. I also sewed my binding on by machine - from the back to the front and used a serpentine stitch on my Bernina 1230 (oldie but goodie machine) to secure it. Love this little mug rug! It is 12" high and about 13" wide. 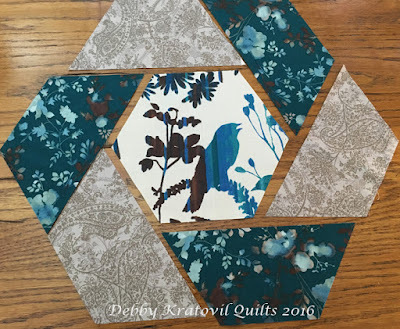 To be entered for a chance to win a fat quarter bundle of Wings, visit Debby's Blog and leave her a note about this collection or the Twisted Hexagon block (or technique). Contest ends Saturday, October 22nd at 11:59 pm EST. Lovely, and the fabric beautiful! Thank you for the no Y seams! This is lovely....love those fabrics! So pretty! I seem to make a lot of partial seam blocks. I seem to be drawn to them. So pretty. I just made a few potholders using a similar pattern. Goes fast. Love the fabric. Am very impressed with the twisted hexi.....need to try that. So pretty, and not nearly as difficult as it looks! 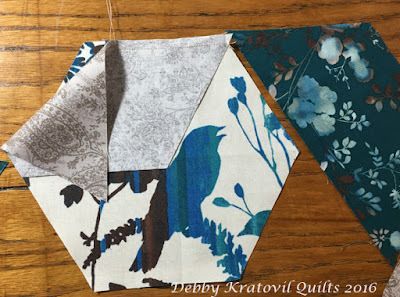 Gorgeous fabric and block. Gotta love a hexie. Beautiful fabric and block.I love hexies! 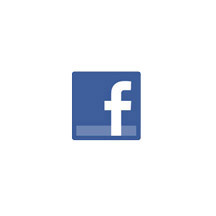 I get tickled when something that looks complicated is really very simple. Twist away! Loved this twisted hexie! Need to try it now. I really like this. Would be a great hot pad too. 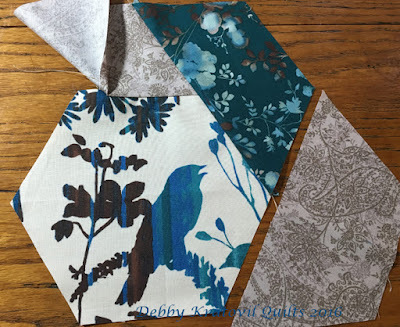 Love the fabric and the mug rug.....would love to make one. Love the fabric and the hexagon!!! Love the mugrug and the fabric Will have to make one or more. Great mug rug design and fabric. Good colors with life but not too much energy for the morning cuppa. I'll be making these for Ghristmas gifts. Thank you! Those bird fabrics are beautiful. I hope to find them soon. Ugh! CHRISTMAS gifts... Silly smart phone! That's a great gift item, and won't even take very long! Thanks!